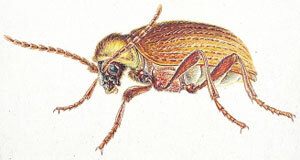 Psocids rarely cause damage directly by feeding and are virtually harmless in small numbers. Large infestations, however, may cause significant damage to delicate materials such as books and furs. Signs of spoilage of dried meat have included holes and tunnels in which the insects hide plus a covering of white powdery material and salt crystals. The major problem posed by psocids is the nuisance which they cause. The insects will contaminate raw or processed foods. They may contribute to a gradual heating of grain stored in bulk with an eventual impairment of its properties and reduction in its value. Contaminated products must be identified and destroyed, which is time-consuming and wasteful. Eggs may be downgraded because of spotting caused by the crushed bodies of dark booklice, e.g. Lepinotus spp. Finished products may be infested in retail premises or in the home, with a consequent loss of goodwill. Pallets, dunnage and packaging may be infested and act as a source of infestation of stored products. Among the wide variety of commodities and materials which may be infested by psocids are the following: bagged nuts, bat guano, chocolate, fish meal, milk powder, museum specimens and books, oil seeds, processed cereals, pollen, salami, skin scales, Springbok biltong, stored cereal grains, sugar beet seeds, yeast and even damp plaster. Although harmless to man, booklice are often confused with true lice and therefore regarded with alarm. As well as infesting foodstuffs in the home they may be encountered swarming over furnishings and walls, including newly plastered surfaces which are still damp. Clearly, materials of both animal and vegetable origin may be attacked but the insects show an undeniable preference for micro-organisms, including bacteria, yeasts, moulds and algae, and populations will develop more successfully in damp conditions where these thrive. This close association with micro-organisms results in these becoming entangled in their bodies and in this way the insects are instrumental in disseminating the organisms which cause spoilage. Because of the opportunities for re-infestation, booklice are difficult to control with insecticides. The most effective method of control is to ensure that premises are thoroughly aired and dry, thereby deterring the development of moulds through the use of dehumidifiers and denying the insects their food source. Commodities should be stacked neatly above the floor level using pallets, away from walls and should not touch the ceiling. A gap between stacks will allow for ventilation, regular inspection, cleaning and, if necessary, treatment with insecticides. Badly infested commodities should be destroyed. Infested pallets can be identified by ‘knocking out’, i.e. dropping a pallet held end on about 75mm (3″) above a sheet of white paper. Booklice are susceptible to a wide variety of insecticides. The problem lies in ensuring contact between the pests and the toxicant in order to bring infestations under control.